It doesn’t matter if you’re into art or not, you’ll still get your jaw dropped when you enter the Torpedo Factory Art Center. The center was founded in 1974 and has now the largest collection of working-artists’ open studios in the nation with about 165 professional artists who work, exhibit, and sell their works. It has been a famous landmark of Alexandria for over four decades, which makes it the highlight of the Potomac Riverfront as well. You can be one of the estimated 500,000 visitors this year. Make sure to purchase an artwork to commemorate your visit. What is waiting for you at the center? Get ready to see a wide variety of painting, jewelry, stained glass, printmaking, sculpture, photography, fiber, and ceramics. The center houses 9 galleries namely: Target Gallery, The Art League, Multiple Exposures Gallery, Printmakers Inc., Enamelists Gallery, Fiberworks, Potomac Fiber Arts Gallery, Scope Gallery, and Site Two and Three Galleries. Alexandria has been observing this tradition for over 20 years now. The event gives a great opportunity for families and kids to have quality time together by doing hands-on craft. Have you gone to a late-night art event before? If not, well you are very welcome to join The Late Shift in the Torpedo Factory and along the riverfront which runs until 10PM. Explore the gallery receptions, listen to artist talks, participate in hands-on art projects, enjoy the live music, watch performances, etc. The center has programs in partnership with outside groups focusing on bringing new artists, art pieces and disciplines to visitors. If you want to enhance and nurture your artsy side, you can register for classes and workshops at the Torpedo Factory Art Center. They have different artistic skill levels at The Art League School to cater to all aspiring artists. You can choose to have fine arts class during the day, evening or weekend. The center also offers summer art camps and workshops for teens, from June to August. It focuses on drawing, sculpture, printmaking, and painting. The camp is quite interesting since the participants will have a different syllabus each week. There are specialty camps for children where they get to learn a specific medium such as cartooning and jewelry making. Does the Art Center offer rental facilities? You can definitely rent the place in the evening hours for weddings, corporate meetings, reunions, anniversary parties, proms, balls, birthday celebrations, rehearsal dinners, and theme parties. You should take note that they have a specific list of caterers that they prefer the most. However, they are still open for suggestions and will check customer reviews first. Also, dancing and amplified music are allowed. 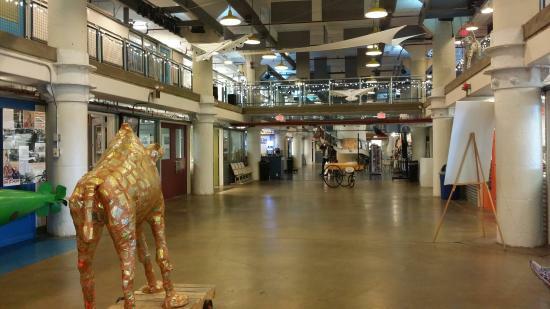 Are you ready for a creative and colorful trip to Torpedo Factory Art Center? Make sure to enjoy every part of your travel and maybe take home some souvenirs with you.